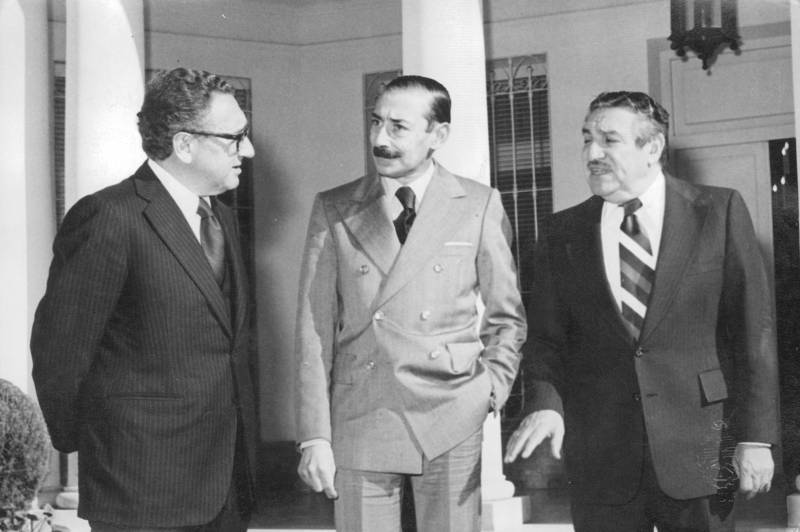 Henry Kissinger was Videla’s guest of honour during the 1978 World Cup. He spent five days in Argentina and provided tacit support to the military dictatorship. It hand’t been five minutes since the Boeing that brought him from the United Stated flew over Buenos Aires, when Henry Kissinger began following to the letter the script he had come to the country to deliver on those June days of 1978. Richard Nixon and Gerald Ford’s former Secretary of State looked out of the window and spoke to the journalists who were covering his journey: “I've always wanted to visit Argentina. The time to satisfy that wish has finally arrived. For the time being, I can see that Buenos Aires is, simply, dazzling”. The man measured each word, he knew what he was coming to do. Henry Kissinger was dictator Jorge Rafael Videla’s guest of honour during the Football World Cup of 1978. During five days he not only attended the last matches of the championship on the River and Rosario Central stadiums but also shared lunches, dinners, reunions, talks and visits to institutions surrounded by celebrities, intellectuals, business and military men. His schedule was organised by the Military Junta and was meticulously planned. His presence transcended mere protocol and held “profound political content”. That’s how the then ambassador of Buenos Aires in the United States, Jorge Aja Espil acknoledged it to Somos magazine, in its 92º edition on June the 23rd 1978. The image society received was different. “Retired from politics” almost three years before, Kissinger came to “visit the country” in his role as a football fanatic. One thing is true: since Mexico 1970, the ex-counsel of National Security of the White House arranges his calendar every four years so as to attend the World Cup. The other one isn´t: in spite of what he told the press, Kissinger had already been in Argentina. Declassified documents from the Department of State reveal that in 1976 “Doctor K” supported the “war” against “subversion” and urged the dictatorship to finish its job “quickly” so as to avoid future problems with the US Congress. Documentos del Departamento de Estado muestran el respaldo explícito de Kissinger al plan de la dictadura. 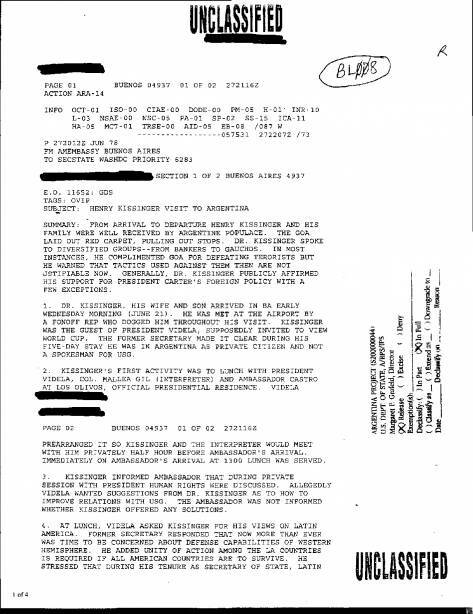 Something similar can be seen reflected on the secret memos sent by the United States embassy in Buenos Aires in 1978, while president Jimmy Carter was trying to spin his human rights policies in the region, after the de facto governments left a pool of blood in the whole of South America since Operation Condor. 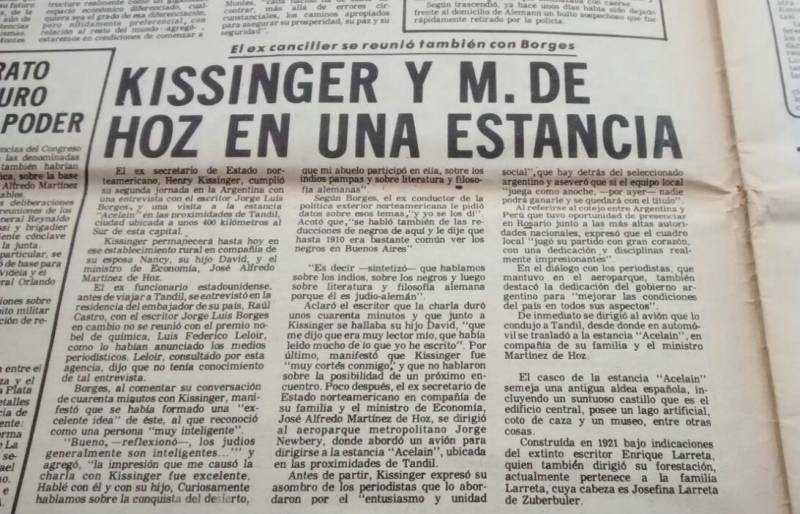 “Kissinger applauded Argentina’s efforts in the struggle against terrorism”, states a cable that offers details on a lunch shared by Videla and his guest of honour. Another dispatch shows Kissinger went even further and claimed that “Argentina’s government had done an excellent job of annihilating the terrorist forces” in a reunion with the Argentine Council of International Relations. All of this was happening while in journals and magazines the former Secretary of State of the United States was shown standing next to the Ministry for Economic Affairs, José Alfredo Martínez de Hoz in a ranch in Tandil, drinking mate in La Rural or having a conversation with writer Jorge Luis Borges and Nobel laureate in biochemistry Luis Federico Leloir. What was the true motive of Kissinger’s arrival to the country, then? For some, it’s very clear. In spite of having left his charge in the Secretary of State, Kissinger had remained a key man, powerful and influential in the international stage. Meanwhile he strolled through the world like a big name celebrity. In Argentina he saw two of the world championship’s matches from the official world cup boxes of the River and Rosario Central stadiums, sitting next to the members of the Juntas. He didn’t even hesitate to accompany Videla and admiral Emilio Massera to the Perú dressing rooms, before the match that César Luis Menotti’s national team won 6 to 0. Before concluding his visit, he granted an interview to journalist Bernardo Neustard, who hosted "Tiempo Nuevo" on Channel 11, and took the time to speak carefully with the press and leave some of his impressions on Argentina. “The country I found is not the one advertised by the international press. Its situation is grossly misunderstood in Europe and the United States (...). The World Cup has projected an excellent image of Argentina towards the world. It’s obvious that the country has made notable progress in a very short time frame”, he told Somos magazine.